Last month we launched a competition for an artist to design the third set of Govanhill notes for the People’s Bank of Govanhill, the winner was Rabiya Choudhry who grew up in Govanhill and now lives in Leith. 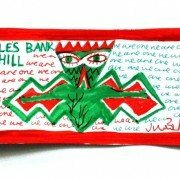 The People’s Bank of Govanhill is a social artwork and local currency project taking place in Govanhill, initiated by artist Ailie Rutherford during her residency at Govanhill Baths in 2015. 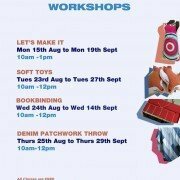 What began as a pop-up currency experiment has grown into a long term project encouraging people to get involved in re-thinking their local economy. The project takes as it’s starting point Govanhill’s already thriving alternative economy, considering the diversity and richness of the local community as a form of wealth. We are looking forward to an exciting week of International culture at the Baths. On Tuesday (09 August) prize-winning Palestinian photographer Hamde Abu Rahme unveils his first solo UK exhibition. Hamde will be touring the country talking of his experiences as a photo-journalist on the West Bank, the exhibition will be at the Baths for the whole of August. Hamde will be joined on the night by Unite! Fight! Sing! the Southside’s socialist choir who will be performing a short set of songs prepared for his visit. On Friday (12 August) Govanhill and Glasgow’s diverse musical cultures come together for a one-off concert in The Steamie. 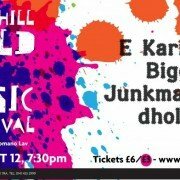 Local heroes E Karika Djal will be joined by dholbeats, Junkmans Choir and rapper/beatboxer Bigg Taj in an evening of music from hip-hop to Irish folk from Pakistan to Prague.